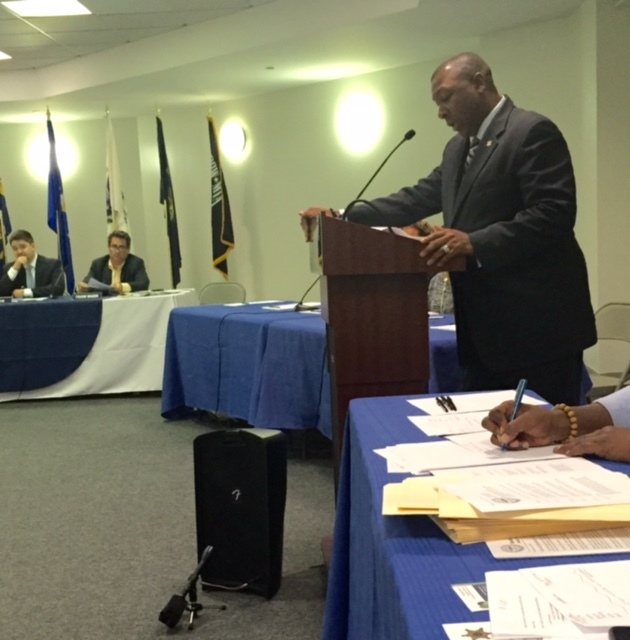 Last night the Suffolk County Jail and its leader Sheriff Steve Tompkins hosted an historic first : a City Council hearing right there, in the jail’s auditorium. It was, said Tompkins, the first time anywhere in the entire nation that a formal City Council hearing had taken place inside a correctional lock-up. 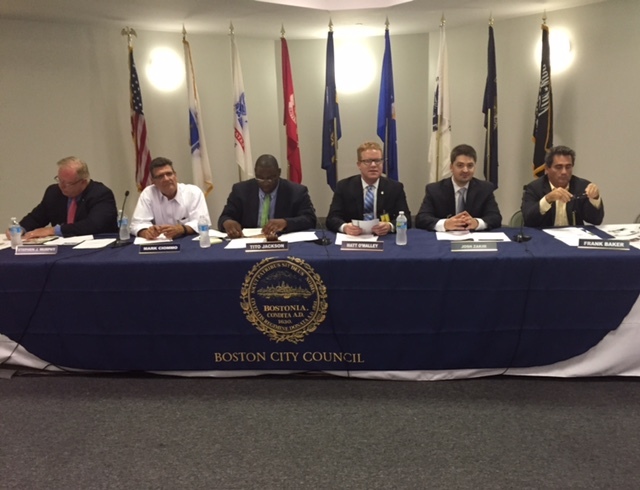 Six Councillors attended : Mark Ciommo; Stephen Murphy; Frank baker; Matt O’Malley; Josh Zakim; and Tito Jackson, chairman of the Council’s Special Committee on the Status of Black and Latino Men and Boys. The audience included State Representatives Gloria Fox and Russell Holmes; council candidates Andrea Campbell and Jean Claude Sanon; and many City of Boston staffers. This Special Committee — which, as Jackson said, also cares about Black and Latina Women and Girls — heard from, and questioned, several panels of witnesses. Including : Suffolk Jail staff; women incarcerated there; City Health Care Officials; the State’s Commissioner of Transitional Assistance; and men incarcerated; police officials; and one Darryl Wright, who announced himself a long term addict now successfully transitioned to the position of licensed addiction treatment counselor. Jail staff testified to the many, many services and educational programs offered; health care people talked about recovery services. The incarcerated witnesses talked about what got them imprisoned and of their plans for a better life — though some seemed daunted — understandably — by the obstacles to making a better life once you have an imprisonment record. These are legion : CORI checks; the absurd cost of reinstating a driver’s license; no family, no money, no home; few skills; not much of a support system; and children to feed who cannot wait for things to fall into place. It is true. In our state, if you become imprisoned you’re almost always in addiction or have mental health issues, or both; and are three to four times more likely to be Black or Latino; and probably lack job skills; and are in the company of, or next to, other people in as bad straits as yourself. Tompkins and his witnesses also made the point, over and over again, that it’s almost impossible for his “guests” to successfully re-enter society. “95 percent of those who live downstairs are coming out,” he said. “And 55 percent of them are coming back.” Why so ? Because against their lack of skills, family support, and money, and their low self confidence, is a system most reluctant to hire people with a tainted CORI (criminal offender records information), few skills, and no ready way of getting to their job. Tompkins did not need to remind anyone that it’s hard enough to get ahead or even to keep on keeping on, for most of us, much less for those re-entering society after a year or two in Suffolk Jail. The challenges hung in the air : are we going to change how we re-receive inmates into society or aren’t we ? Are we going to reform sentencing laws or not ? Are we going to change the laws that take driver’s licenses away from people for offenses not connected with driving ? Tompkins’s coup de theatre succeeded. The City took notice of this Council hearing. Hopefully so will the legislature. We cannot continue to keep so many people in prison, nor incarcerate so many people of color.